Transcend-Plantal Meditation is a natural source of plant bio-stimulants from the North Atlantic Ocean that trigger numerous beneficial plant responses… the most important of which is the total elimination of transplant shock. Plants can be transplanted repeatedly without any downtime. Often, transplants made without this aid can take as many as 2-3 weeks to recover from the shock. Moreover, T-Plantal Meditation gives plants the resilience, health, and vigor they’ll need to reach their genetic potential. It is a water soluble powder (WSP). 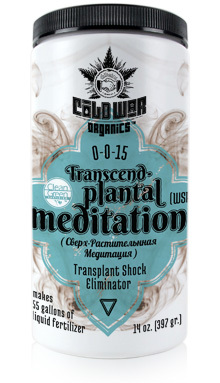 T-Plantal Meditation is available in 14 oz. and 44 lb. containers. Constant agitation is NOT required – This material is completely soluble and, once dissolved, will not settle out of solution. However, we recommend that the necessary amount of powder be dissolved in a small amount of warm water first and then added to the total volume of cold water. Be sure the powder is completely dissolved in the warm water before adding it to the total volume of water. Mix only the amount you need – Microorganisms are everywhere and, given an ample supply of natural nutes and water, they will multiply and sometimes create objectionable odors. This product is stable as a dry powder but, once water is added, it can become biologically active. Mix only what you’ll need for the immediate application. If you’re using an irrigation system, rinse with clear water after use. Here is a 1 minute video on how to quickly and easily mix T-Plantal Meditation. Apply to soil (not to foliage) – The nutes in this product are designed to feed the organisms that create healthy soil as much as they feed the plants. 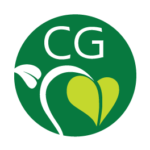 Biological activity is as important in soilless or bioponic media as it is in a natural soil or compost. Applications to foliage will not harm plants but may stain leaf and bud surfaces. Dose – This product will alleviate or eliminate transplant shock. We recommend mixing two level teaspoons of the powder/gallon (dissolved in a small amount of warm water first). Transplant cubes or blocks can be soaked in the solution for 15 minutes before transplanting. If soaking is impractical, drench the soil with the solution immediately after transplanting and repeat daily for 5 days.